Donations to Madison House Autism Foundation are also very much appreciated. 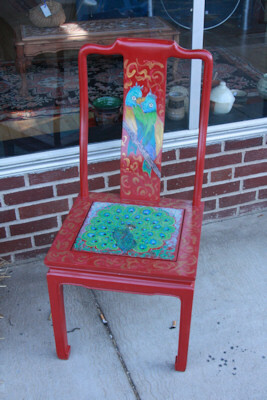 "Hand-Painted Chair with Birds by Donna Bean" © 2008 Miriam A. Kilmer, chair © 2008 Donna Bean; may not be reproduced in any form without permission from both copyright holders. Donna Bean ~ Pottery, Whimsically Painted Furniture. Donna is a founding member of The Art Group. Thank you for the frames, Donna! 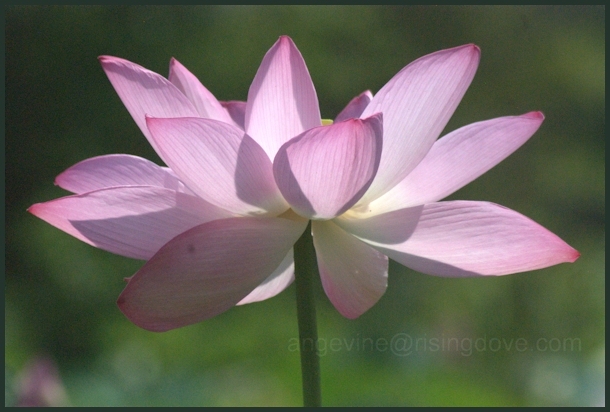 Wendy has kindly agreed to allow me to publish her work her under a Creative Commons licence. She is a member of The Art League. This beautiful drawing, "First Born," won a major award in the October 2008 show. Alex Hofgren ~ "Alex is endless curiosity about color and shape." Carly Goss ~ Carly is a handweaver in Baltimore, MD. She holds a degree in Fibers from the Maryland Institute College of Art. She teaches beginning weaving courses to adults. Carly and I know eachother through our mutual enthusiasm for singing shapenote music. I am especially grateful that she uses many sustainable materiels in her artwork. Martin Kilmer Wild Things Photography "Land Forms and other Works of Nature" at the Wildwood Cafe, 425 King St., Bridgewater, NS. It was up for the month of September. William Swetcharnik ~ "As artist, William Swetcharnik uses the vocabulary of old master paintings to summon up images from centuries of art history and weave them into a complex architectonic fabric."